Kettlebells are incredible. That’s all there is to it! Such as simple but awesome fitness tool you can use anywhere. If they do have a downside the only one I can think of is flexibility. What if you could solve that with an adjustable kettlebell? I’m a kettlebell training nut and highly recommend that anyone who wants to try kettlebell workouts should give it a try. As long as you know what you are doing a good kettlebell set is all you need. If you are not familiar with kettlebell workouts or the famous kettlebell swing then let me fill you in. A long time ago in the Soviet Union (don’t worry this is not a history lesson or a fairy tale) circus strongmen started to use kettlebell weights in their acts. Before this, they had been primarily used as counterweights to measure crops and produce. This then evolved into a recreational sport in the late 19th century which we now refer to as kettlebell training. Apart from the wide use of the kettlebell workout in Russia, it gained mainstream popularity across the world in the late 90’s. This popularity continues today with a kettlebell rack or kettlebell set being common in many gyms. While there are a wide variety of exercises that can be done with kettlebells the most famous is probably the kettlebell swing. If you have taken part in any kind of kettlebell workout you have probably attempted a kettlebell swing. They are one of the best exercises you can do and hit many muscles while burning up some serious calories. It is important however to ensure you are executing the movement correctly so as not to injury yourself. If you are unsure how to do this you may want to consult a personal trainer. Here is a quick video with the correct technique. Adjustable Kettlebell – How does it work? 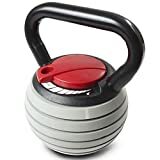 So if you live in a mountaintop hut in Siberia and are looking for a workout then the best kettlebells to use are just about any you can find. You won’t have a storage problem or need a neat and tidy kettlebell rack to keep your kettlebell set on. I’m gonna take a guess and say you don’t actually live on a mountain in Siberia and that you are here because you want the benefits of kettlebell training without the hassle of storing twenty-five different kettlebell weights. So that is where the adjustable kettlebell comes in. Now I have to say I was skeptical about the concept of an adjustable kettlebell. I have always like the solid feel of a regular bell when I workout. So I went into this with an open mind and gave it a try. I am going to tell you exactly what I thought and how I found the training but first let’s look at some of the options available to you. There are a bunch of different kettlebells out there to choose from both standard and adjustable. I took what I feel are ten of the best options available and considered them all. This list is the top 10 and gives you a great overview to help make a decision on which kettlebell set will work best for you. At first glance, you may think that the Stamina X is a regular solid kettlebell. Unlike some of the other options, it really does resemble a standard kettlebell shape very closely. It is however as the name would imply adjustable. It provides a good weight range from 16 to 36 pounds. This means it covers everything from beginners at the lower range up to a mid-level (intermediate) at the top end. Within the kettlebell weights range you have six options to choose from which increase in blocks of 4 pounds. This gradual increase option is very helpful when you are trying to level up your fitness levels. Being able to progress gradually makes it sustainable and a kettlebell set you can use long term. For example, if you purchased a single 16-pound kettlebell you would improve your strength and then have to buy another one. I suppose this goes without saying for this adjustable option. As I already mentioned its shape is very similar to a solid kettlebell. Apart from the visual impact of this it has other advantages. Some adjustable bells are strange shapes and can hit off your legs or body when being used. The regular kettlebell shape ensures clean, smooth movements and a great ease of use. Speaking of ease of use its quite easy to adjust. You select the weight setting you want to use with a locking pin. If you are using all 36 pounds then they will all be locked into the bell. If you are using a lower setting the the remaining unused weights stay in the holder. When using the Stamina X, I found the handle to be easy to grip and unlike some other options I could easily grip with two hands for certain movements such as the kettlebell swing. It has a textured coating which helps with the grip also. Some smoother handle options can be very slippy especially once you start sweating. Its not the cheapest option from our list but when you consider overall ease of use and the wide range of weight I think its excellent value for money. The only thing I didn’t like about the Stamina X was the clinking of the weights when in use. This is just one of those things as the weights need to be easily removable which makes them move when being used. Adjustable weight range from 8 - 40 lbs. In complete contrast to the Stamina X, the Kettle block looks very little like a traditional kettlebell. This is probably a little obvious from the same as they refer to it as a kettle block and not a kettlebell. It also has another important difference to note. There are two different models each with a different weight range. The smaller one has a max weight of 20 pounds with a full range of 5-20 pounds. The larger one has a max weight of 4o pounds and has a full range of 8-40 pounds. My personal choice would be the larger powerblock kettleblock. At the lower end, it’s only slightly heavier than the smaller option but it has a much higher range with the 40-pound upper weight limit. This means it is much more versatile and will be more useful long term as your strength & fitness improve. The weight adjustment system is well thought out and makes it very easy to make quick changes between exercises. The weights are indicated under the handle and the pin can quickly select the desired weight. While the size changes depending on the weight selected the overall shape stays the same. From all of the adjustable kettlebells in this list, the kettleblock stands out in terms of quality. It is incredibly well made. Unlike the Stamina X above there is no rattling noise when you’re using it. Weights seem to be very well secured in the block without making it any more difficult to adjust quickly. As I already mentioned my preference is the larger 40-pound block but if you are a beginner you will still get plenty of use from the smaller 20-pound option. The smaller powerblock kettleblock also allows you to increase the weight in smaller blocks which you might want to note if you are just starting out. The handle again is well made, big enough to be used two handed for our favorite kettlebell swing. The Powerblock Kettleblock is at the higher end of the pricing scale but this really is an all in one, high quality, long-term fitness tool. The only thing I didn’t like was the shape. I’m a bit of a purist and prefer the traditional kettlebell shape. I must say however that I would overlook this for the flexibility and quality this bell offers so keep that in mind. Next up is the Empower 3 in 1 adjustable kettlebell. Empower tell us that this bell is specifically designed with women in mind. This may be so but I will be looking at it compared to the overall options as some of these branded items can be misleading. Since this bell is made to be marketed specifically to women is has a very different design to the previous options. Firstly the weight range is a lot lower. It has a max weight of 12 pounds. While this might be fine for beginners it will not be a long-term option for many as they will quickly outgrow the top weight. Women are just as capable as men when it comes to lifting weights of any kind. So my opinion here is that you should look at all the kettlebells regardless of marketing and choose the one that will work for you for the long term. Those with smaller hands may find the smaller plastic handle easier to grip than standard iron kettlebells. However, the plastic handle does make it slippy once you work up a sweat and is not suitable for those with larger hands. The max weight as I already mentioned is 12 pounds. 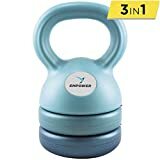 It starts out at a bottom weight of 5 pounds and has one more option in the middle for a total of three weight options. I do think this range is very limiting and that the lower initial price is a false economy as you will need to upgrade or buy an additional kettlebell soon after this one. On the plus side, it is a cheaper option for anyone looking to get started and those looking for a more feminine design may favor this one. If you don’t plan on progressing to heavier weight ranges then it might be for you. Similar to the powerblock we looked at above, the Rocketlok adjustable kettlebell comes in two different models. 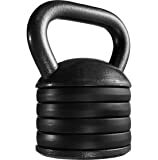 Like the Stamina X, the Rocketlok very closely resembles a standard kettlebell in terms of shape and size. Essentially it’s a regular kettlebell with the benefit of being adjustable. The smaller of the two models has a max weight of 20 pounds and an overall range of 14 to 20 pounds. There is an additional setting at 17 pounds to choose from in the middle. The larger Rocketlok bell has a max weight of 36 pounds and an overall range of 24 to 36 pounds. With the wider weight range this on has four weight options so there are a few additional options for your workout. The only thing that I found frustrating with the Rocketlok was the plastic locking cap. This is important as its what you use to adjust the weight. You have to remove the cap and then either increase or decrease the overall weight by adding or removing the cylinders the bell uses as weights. Despite the plastic cap, once fixed in place there is no movement in the cylinders like some other models. So no noise or clinking of weights. This is a plus as when you are training it feels smooth like a regular solid kettlebell. I do really like the Rocketlok overall due to its high quality and traditional kettlebell look and feel. However to get a full range of weight you would need to buy both models. This is expensive and some of the other models we have looked at deliver the full range in one adjustable kettlebell so it will come down to your personal choice. One thing I did really like was the handle. It’s a lot thicker than some of the other models which makes the workout more challenging. Keep in mind that if you have small hands you may not like this feature. Having a wider grip does have the upside of helping to improve your forearm and grip strength so it’s worth considering. Speed pin lock to quickly adjust weights in and out. Maximum stability during use. Adjustable in 11lbs increments. Min 10lbs - Max 83lbs. Recommended for CrossFitters, Personal Trainers, and all athletes. Without a doubt, the widest range of options come from the Mir Pro Adjustable Kettlebell. 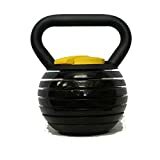 It has a huge kettlebell weights range starting at 10 pounds and increasing all the way to 83 pounds at its peak. If you have ever tried a kettlebell swing with 83 pounds you will understand just how much this is. Think of an entire kettlebell set and kettlebell rack in the gym. The Mir pro replaces all of that in one go. It also has one of the lowest price points per pound so overall it delivers serious value. It has an interesting and unique locking system. Unlike the others, it has a double pin lock system built into the handle. This works by securing the kettlebell weights which in this case are not unlike barbell plates in two locations, top and bottom. As I have mentioned in some of the other kettlebell reviews above movement of the weights and rattling can be an issue with some models. This double locking system on the Mir pro eliminates this problem and does it really well. Once again it has a wide handle perfect for using two hands on certain exercises and providing a good grip when training. I want to point out that I really like this kettlebell. It just has such a range it’s hard to overlook but there are some things that you need to know. It’s quite tall. This can cause issues for certain exercises or even more of a problem if you are not very tall. 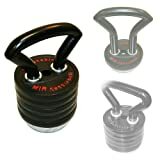 When swinging the Mir pro it cold hit your body which can be annoying and cause injury. Additionally, the adjustment of weight can be tricky. Some of the other models like the powerblock kettleblock are quick release and can be adjusted quickly. This is not the case with the Mir pro. It’s more like changing the weights on an older style dumbells set so you need to be ok with that. So it can take a little extra time to complete your workout due to the downtime changing the weight. The weight itself also has less flexibility in terms of scaling up. While some of the others have small increments like 3 or 4 pounds the Mir Pro blocks are 11 pounds. This can make moving up a weight tricky especially for beginners. Even with these downsides I really like the Mir Pro. It’s incredibly good value for the amount of weight it delivers and you will need to train for a long time to begin to outgrow it. If you don’t mind making adjustments and workout around the weight blocks its a really great choice. The fitness gear adjustable kettlebell is a little different from the others we have looked at. While it does weigh 20 pounds by itself it can be adapted up to a max weight of 50 pounds. This addition of weight can be done in two ways. The first is to add standard weight plates which can be fitted to the frame which is designed to take standard plates with a 1″ hole. This is the best option and provides the maximum weight. However, it does require already having plates of making an additional purchase of whatever plates you need. It can take different sizes such as a max 10-pound plate or 2.5 or 5-pound sizes. The second way is to use the spacers that come included with the kettlebell. They are hollow and so they can be filled to increase the weight. This is not ideal but if you choose this option you can add water or sand and it does the trick. Similar to some of the other options if you have plates which take you all up to the 50-pound level then you will replace the need for having numerous kettlebells. So it’s pretty flexible with the standard and upgrade with plates options. The locking system is simple enough. You disconnect the bottom section which by the way is 5 pounds in weight by itself. You can then add the weights or spacers to the frame. The locking works pretty well with little movement or noise. As I like to see the handle is wide enough to comfortably carry out two-handed exercises. It provides good grip and is a nice size. It can seem a little big with all of the large plates bolted on but overall its a nice feel. Overall its a solid option but do remember if you want to max out the 50 pound limit you will need to buyt the extar plates. The Titan fitness bell comes in at the lower weight end of the scale. With a max weight of 20 pounds, it is a good starter kettlebell for a beginner but the intermediate user will struggle with this one. It does, however, give a lot of options with adjustments of 2.5 pounds all the way from 5 pounds to the full 20. A great range for someone starting out with kettlebell training. Actually changing the weights it pretty easy too. It has a nifty built in quick lock system. This makes it super fast to swap plates in and out. Handy if you’re changing up a lot during a workout. Once again a nice wide handle leaves all the options open for two-handed exercises and has good grip. Overall it delivers a lot for the money. If you’re starting out I would go for this as its reasonably priced and very flexible. That along with the quick adjustability makes it easy for a newbie to stay on track. Since I am a fan of the traditional kettlebell shape this one fits the bill. On the downside, it does make a little noise as the locking system does allow some movement. I find this annoying but if that doesn’t bother you then it won’t be an issue. Like the Fitness gear kettlebell, the Kettlebell kinds bell is adjusted using weight plates. With an upper weight limit of 40 pounds and a range increasing in 5-pound blocks all the way up from 10 pounds it’s a nice overall spread. It should be fine for beginners and also for intermediate level. 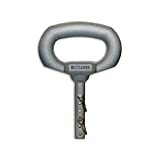 Changing the weight is very similar to the Titan fitness kettlebell with a quick lock system. You can add or removed plates quickly and lock it back into place. There are a lot of similarities to the Titan bell here. It has the same familiar, traditional kettlebell shape. Unfortunately as with the titan the locking system means the plates can be slightly loose and will make noise. As you have probably guessed by now I really don’t like that. It may not be an issue for you but just keep it in mind. It’s not a bad kettlebell overall but would not be my first choice. The Kettlebud is something completely different. While by itself it only weighs 5 pounds and is basically just a handle it is the most scalable kettlebell of all in this list. So how does it achieve this? Well, it’s made from military grade aluminum. This allows you to load it up with a maximum of 185 pounds. I doubt too many of you will need a kettlebell that’s heavier than that. Very simply you just need to add weight plates up to whatever weight you want. A super simple locking pin system allows quick additions and removals. Now, of course, you will either need to have Olympic weight plates already or buy some to go with it so factor that into your decision. These will add cost and storage issues. On the plus side without the plates, the Kettlebud is highly portable. I travel a lot and this can be chucked in my travel bag and I can just grab plates at a local gym and get going. This is an important feature as many gyms will have plates but not kettlebells. This is especially true in hotel gyms so think of it as the traveler’s friend. It has a slightly unusual handle shape but you get used to it fairly quickly and the grip is quite good. It is a compact design but you can just fit two hands for those double-handed movements. As you might have guessed its pretty much indestructible so you won’t have any issues there. The add-on costs of weights may be a deciding factor but it could be a great complement to your existing workout if you already have Olympic plates. So there you have it. Lots of options out there for you to choose from. They all serve slightly different purposes but they all have there place. My personal favourite in terms of overall value for money is the powerblock kettleblock and also because of how broad the scope is for what you can do with them.